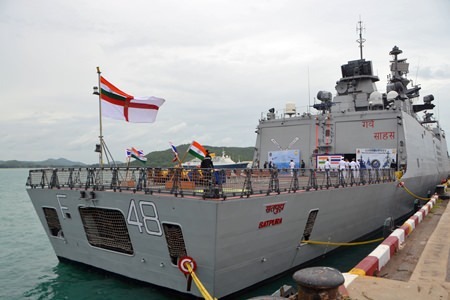 Two Indian Navy ships and 500 sailors moored in Sattahip for four days during a goodwill stop in the naval contingent’s 45-day “Act East” tour of Southeast Asia. 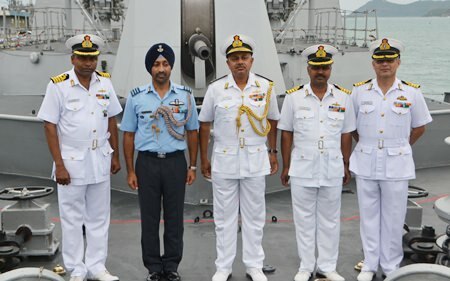 Rear Adm. Ajendra Bahadur, commander of India’s Eastern Fleet, brought the INS Satpura, an Indian-built guided-missile stealth frigate, and the INS Shakti Deepak, a tanker support ship, into the Sattahip Naval Base’s Juksamet Port June 23. 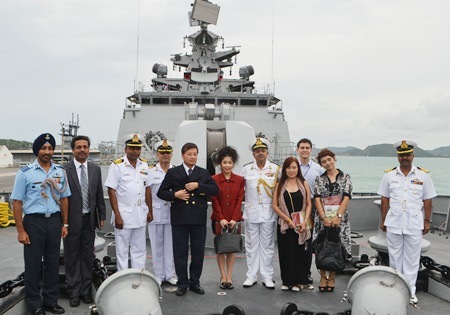 They were greeted by Vice Adm. Banpot Kerdpoo, the Royal Thai Navy Region 1 deputy commander, and other top officers. He told Bahadur that he hoped the extended visit would strengthen Thailand and India’s bilateral ties. 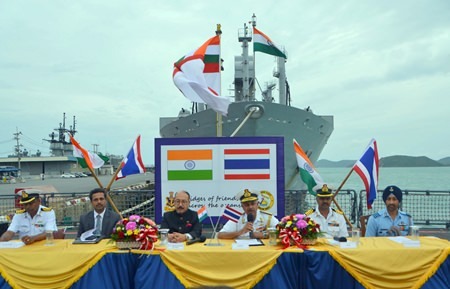 Visiting Indian naval officers and the Indian Ambassador to Thailand hold a press conference off the bow of the INS Satpura. 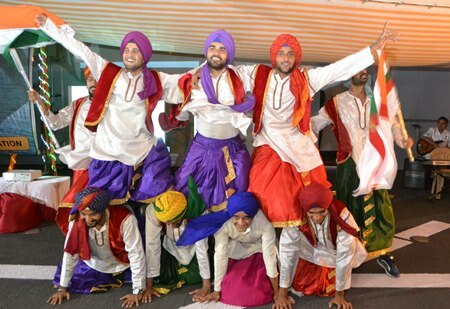 The Indian ships are on a six-week operational deployment to Southeast Asia and the southern Indian Ocean. The ships, along the INS Ranvir, a guided-missile destroyer, and INS Kamorta, an ASW Corvette, are now on the return leg of the deployment that also took them to Cambodia, Indonesia and Australia. During this deployment, the two warships also participated in the bilateral exercise SIMBEX-15 with the Royal Singapore Navy from May 20-26. 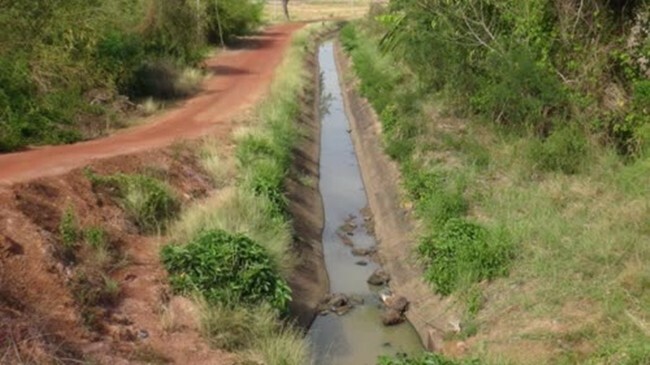 The Satpura is commanded by Capt. Hari Krishnan and the Shakti by Capt. Vikram Menon. The visit also is aimed fostering interoperability between the two navies. 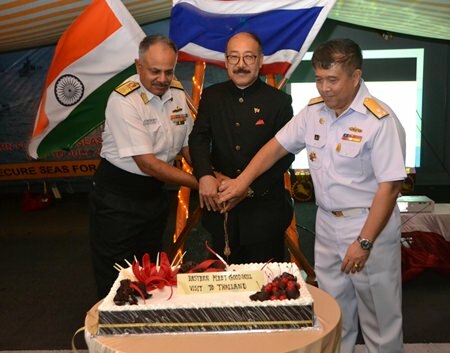 (L to R) Rear Adm. Ajendra Bahadur, commander of India’s Eastern Fleet, HE Harsh Vardhan Shringla, Indian Ambassador to Thailand, and Vice Adm. Wipark NoiJinda, Commander of Sattahip Naval Base cut the cake together to welcome one and all to the party. 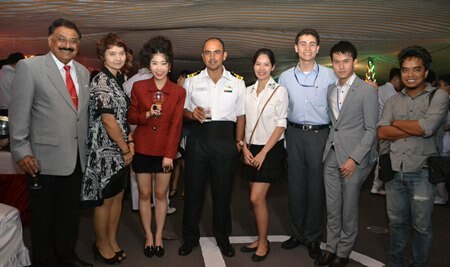 The Satpura hosted a June 24 welcome reception with Indian Ambassador to Thailand HE Harsh Vardhan Shringla attending, along with high-ranking Royal Thai Navy officers, and guests from the navies of Australia, Singapore, Indonesia, and Malaysia. 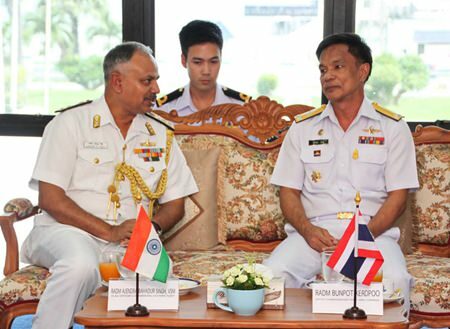 The four-day visit saw official calls by officers on Thai dignitaries, the ships opened to visitors, guided tours for Indian naval personnel and professional interaction between personnel of both navies. Rear Adm. Bahadur is a graduate of the National Defence Academy and was commissioned in July 1983. A specialist in navigation and aircraft direction, he has commanded four other warships previously. 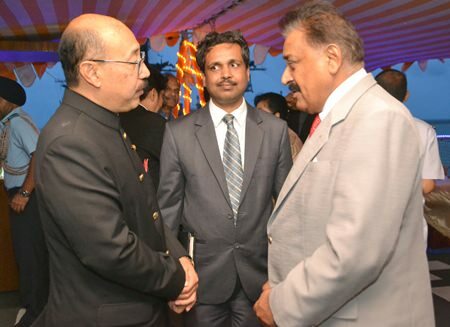 HE Harsh Vardhan Shringla (left), Indian Ambassador to Thailand, chats with Pratheep S. Malhotra, MD of Pattaya Mail Media Group at the welcome party. At the helm of Satpura since May 2014, Krishnan is a specialist in naval weapons and also an alumnus of the Fuhrungsakademie in Hamburg, Germany. Commissioned in 1989, he had held seagoing appointments for 15 years, including the command of the INS Karmuk. The Satpura is a multi-role stealth frigate carrying a wide array of weaponry, including surface-to-surface and surface-to-air missiles, augmented by anti-submarine rockets, a medium-range gun and close-in gun systems. The ship is also capable of carrying two integral multi-role helicopters. 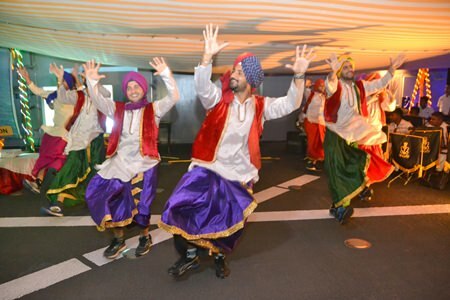 The highlight of the evening was when Sikh naval officers performed the Bhangra dance much to the enjoyment of guests from many countries. The Shakti is a fleet support and replenishment ship, one of the largest in the Eastern Fleet. It is capable of multi-ship Underway Replenishment with a net fuel transfer rate of 1,500 tons per hour. She is also equipped with state-of-the-art electronic systems and four 30mm guns. The Eastern Feet came into existence in June 1971 at Visakhapatnam. It initially comprised the aircraft carrier Vikrant with its escorts and a few amphibious ships. It witnessed action in December 1971, which finally resulted in the creation of Bangladesh. The Eastern Fleet today is a composite force with multidimensional capability. Ships with different roles from missile destroyers to Corvettes and landing ships form the fleet. Today, the Eastern Fleet is the flag bearer of India’s “Act East” policy with regular overseas deployments. It operates in and across the southern Indian Ocean and South China Sea from mid-May to early July.